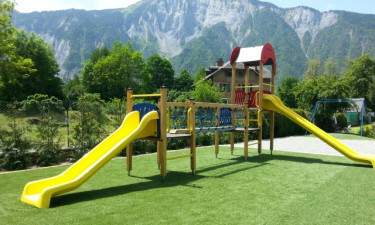 Set against the breathtaking Alps, the campsite offers spectacular views for travellers looking to escape into nature. 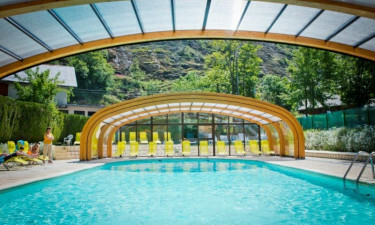 For a luxury camping experience with many outdoor activities in an astonishing setting, book A la rencontre du Soleil with LuxCamp. Set within luscious green forests and well-kept gardens, this is a luxury camping holiday with secluded mobile home accommodation. Centred by a lively entertainment quarter come restaurant, families can intermingle and enjoy comfortable, natural surroundings. 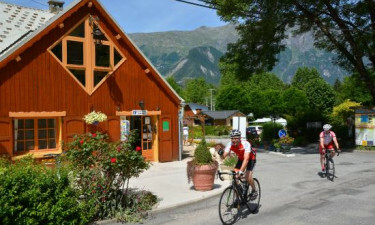 There are impressive views of the Oisans and its valleys, which can be explored by foot or bike at your leisure. Why choose A la rencontre du Soleil? Kid's club with activities & games. Evening entertainment and weekly concerts. Many walks and natural sights. With so much to explore in the region, a swimming pool is always waiting for you back at camp. Surrounded by deckchairs, the roof of the pool is opened in good weather for you to soak up the sun when you're making waves. It is the perfect place to relax. With an open terrace overlooking the local valleys and cliffs, A la rencontre du Soleil's restaurant serves up local Alpine specialities — like tartiflette, raclette and fondue — in full view of the mountains.